☆ Significant margin over ANSI/TIA 568-B, ISO/IEC 11801and EN 50173. ☆ Twists are maintained to within 1/2" (12.7mm). 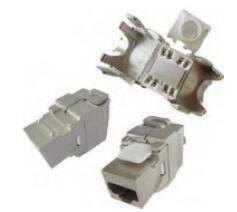 ☆ Work in standard keystone jack opening (0.58" x 0.78" or 14.7mm x 20.1mm). ☆ Unshielded and shielded versions available for choice. ☆ Accept 110 punch down tools or Krone punch down tools. ☆ Color coded for 568A and 568B wiring scheme. 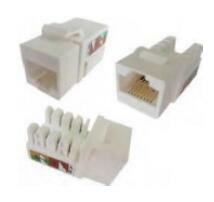 ☆ Swept frequency tested up to 150MHz for Cat5e jacks, 300 MHz for Cat 6 jacks and 500 MHz for Cat6A jacks. ☆ Made of UL-94V high impact and fire-retardant ABS material. ABS material is characterized by good impact, chemical & fire resistance.UL94V-0 is the highest standard on fire resistance. 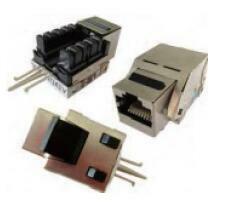 ☆ Beryllium copper contacts for superior connectivity, with 100μ" nickel baseboard furnished with 50μ" gold plating. ☆ Support 22 -26AWG wire gauge. 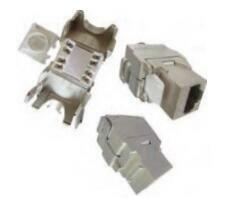 ☆ Plug & Keystone Jack Contact Force: 100 g.
☆Full seal design ensures reliable termination and stability. ☆Supplied with a color coded dust cover for dust and dampness protection. ☆IDC contact design eliminates need to strip individual conductors and ensures reliable termination. ☆With a patented technology, all twists are maintained to within 1/2", improving the NEXT value to a great extent. ☆Dust caps/retention caps offer termination with strain relief. ☆Rear part of the jack printed with EIA 568B pin assignment to ensure fast termination. ☆Being component tested, the jacks can work in harmony with lower class products. ☆Provide extra NEXT margin in support of future gigabit application. ☆Provide fully shielded design to ensure the best screening performance. ☆Toolless design can speed up the installation process and save installation costs. ☆100% full shield design can improve EMI/RFI performance. 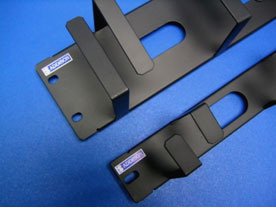 Shield at the jack rear part can effectively protect IDC termination against EMI interference. 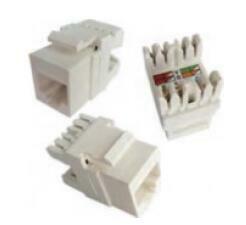 They allow flexible grounding for shielded cable for each IDC. ☆Shielded panels incorporate 3℃ 60 stainless steel for full EMI (Electro-magnetic Immunity) shielding required by EN 50173. ☆Compact design can support high density installation.